It’s not often that packaging sleeve notes are underwhelming — they tend towards excessive hype — but those of Deep House don’t really do it justice. “Everything has been designed to conform to the musical genre,” the blurb says reassuringly, but there is no mention of innovation or inspiration. It’s true that the content, comprising drum loops, synthesizer patterns, voices, bass lines, chord progressions, atmospheres, percussion and sound effects, perfectly matches the title of the sound library, but it also sounds great! This is partly down to the enhancing effects of tempo?synchronised ping?pong delays, subtle envelope filters and lush reverbs, all of which have been applied, in varying proportions, to much of the material. Some libraries serve their samples untreated so that the end user is left with more processing choices, but in the case of Deep House, where atmospheres are key, the effects are most welcome. 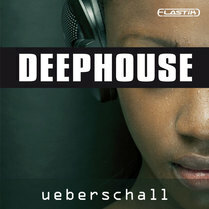 Deep House adheres to Ueberschall’s favoured ‘Construction Kit’ format, sharing its collection of over 1100 loops and samples between 24 kits whose tempos range from 119 to 127 bpm. Each kit presents a song?like idea, but the individual samples and loops it comprises can be rearranged, processed or used in a different composition. Alongside each folder of Main Kit samples is the Variation Kit folder, providing alternative track phrases, plus two further kits entitled Intro and Outro. The same pattern is repeated throughout, except in one or two cases where a folder named ‘Addons’ offers a selection of soulful female vocal parts. The singer’s performances are extremely good, but possibly the one element worth avoiding if you’re trying not to sound like the Kit demo. Much more universally flexible are the deep, resounding basses, snappy snares and delayed synth stabs, which suggest all sorts of possibilities. Appropriately, the vast majority of the sounds manage to be both punchy and smooth at the same time, enabling them to sit well in the mix, but retain definition. It may have been Ueberschall’s main intention to produce something that conforms to the deep house genre, but many of the samples could easily be used in completely different compositional contexts. This is in part because the kits are made up of clearly defined beats and sounds, rather than long chord sequences, as some libraries tend to be. Admittedly, that is the nature of this type of music, but credit must also go to the creators, Marc Steinmeier and Ron Paul, for breaking the construction kits into useable building blocks.